Posted Thursday, August 28th, 2014 by Robyn Warner. With laptops changing over to tablets and cell phones replacing all landlines, the way we work is changing too. Office floor plans and designs need to keep up with the current flow of today’s workers. Check out what trends are helping companies run at the peak of their productivity and how you can adapt these trends to your work place. Open floor plans with nooks along main paths or common areas are perfect for sharing ideas with co-workers. Sometimes this is all an employee needs to find a solution to a problem or to boost creativity on a project by collaborating with others. Nooks invite these kinds of conversations to take place. Another trend in office design is creating conference areas directly in common spaces. Being in the hub of activity keeps the mind awake and the energy up, but can also bring in more distractions. Include private booths as well for those employees that are easily distracted or when work conversations need to be kept confidential. More kitchens and eating areas also bring about collaboration among employees in a relaxed environment. Some of the greatest stories or ideas are shared over food. In the past, we never worried about finding an outlet once our desktop computer was plugged in and running. Though many people can take tablets with them and make an office area wherever they go, they’ve got to get charged up sometime. Placing outlets at a convenient height and in a visible area is far more preferable than crawling under a desk to get a charger plugged in. 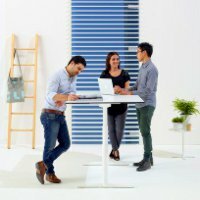 Stools and tables placed at standing height are becoming popular as workers are more mobile, active and aware of the adverse health effects prolonged sitting can cause. We’ve mentioned before that natural light is the best in a work area, but bringing more of the outdoors inside is even better. Employees who feel less cooped up are often much more productive. Flood common areas with natural light as much as possible. 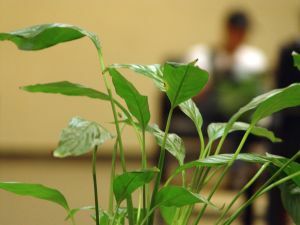 Another idea is to add green plants throughout the office, which makes work spaces feel much more inviting. Read more about office design. What trends do you see happening in the way people work? How can other office designs cater to employee needs in the changing world of technology and the way we work?